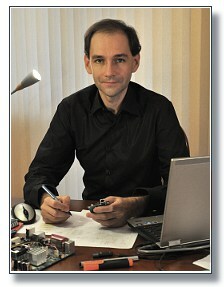 ELESOFTROM Company was founded in 2008 by Piotr Romaniuk, Ph.D. as new form for his interests and works on programming embedded systems. The most interesting for us are projects with real-time requirements that imply building multithreaded firmware. In our desings we take care about: performance, effective solutions and reliability (see testing of our RTOS - DioneOS). We specialize in fixing complex hardware-software problems that are manifested by unexpected hang or reset of the device. In such a case, we use advanced recording and analysis methods (e.g. use of logic analyser for debugging the software by real-time tracing, together with log parsers and translators). We provide and have experience in consulting services for external companies. We analysed reliability of their firmware, evaluate the source code and architecture design. After that review, we identified weak points, bugs that had yet been undetected, proposed how to fix it. We were and are able to do refactoring of the software and extend it by new functionalities as well. - He was conducting research on formal methods for system behavior description.